Friday a couple of weeks ago, my daughter and some of her friends skipped school to attend the walk-out climate strike that took place all over the world. What most people might not know is that this walk-out happened thanks to one young activist all the way across the world in Sweden. Greta Thunberg is a 16-year-old political activist whose goal is to stop global warming and climate change. 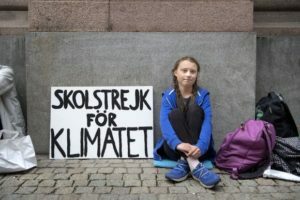 In the fall of 2018, she began her Friday walk-outs outside the Swedish Parliament in Stockholm, Sweden as a strike for the climate. The movement became well known under the hashtag #FridaysForFuture.This tactic inspired 1.4 million children in more than 100 countries around the world to carry out similar protests last week. 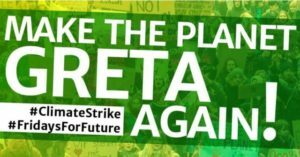 In December, Greta gained international attention after speaking to world leaders at the UN Climate Talks in Poland, and at the World Economic Forum in Davos in January. “Adults keep saying: ‘We owe it to the young people to give them hope.’ But I don’t want your hope. I don’t want you to be hopeful. I want you to panic. I want you to feel the fear I feel every day. And then I want you to act,” Greta told them. 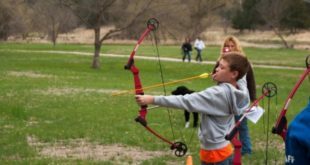 Greta, a shy, petite girl with Asperger Syndrome, is still getting used to the media attention she has been receiving recently. One of three children, she started her fight for the planet in 2016 when she convinced her family of 5 to go vegan and stop flying in order to make an impact. Greta might look like just a small child, but when she is interviewed or gives a speech, she seems wise beyond her years. Sheis quite active on Facebook and Instagram. Earlier this year, Greta was chosen as Woman of Year in Sweden, and now has been nominated as a candidate for this year’s Nobel Peace Prize in Oslo. If she were to win, Greta would be the second youngest recipient, after 17-year-old Malala Yousafzai, who won in 2014.